What a weekend! 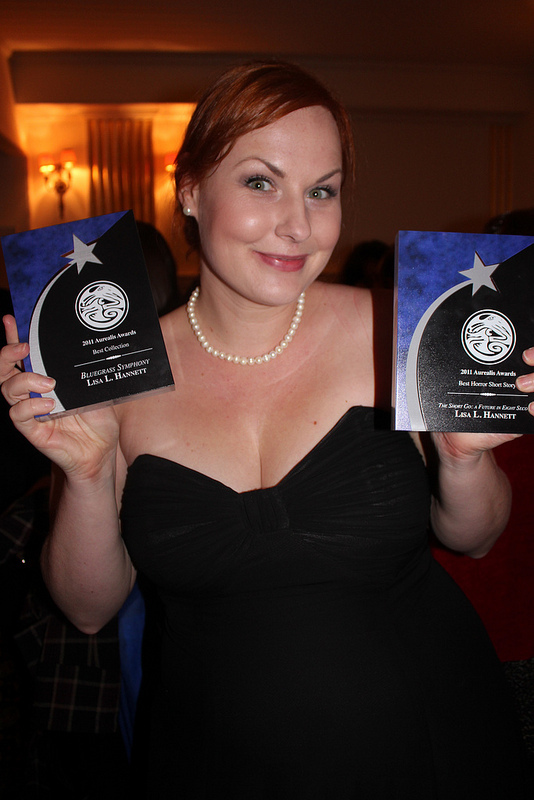 I always have a blast at the Aurealis Awards, but Saturday night felt like a dream. SpecFaction NSW put on an incredible show in Sydney; the drinks flowed before and after the awards, the ceremony ran super-smoothly (Kate Forsyth in her AWESOME red leather gloves was a fantastic MC) and the vibe throughout the evening was electric. This photo of Cat, Liz and I (taken from Cat Spark’s photoset) sums up the mood on Saturday night: happy, boisterous, supportive, and so much fun. Like the Australian speculative fiction community in general, I’d say. 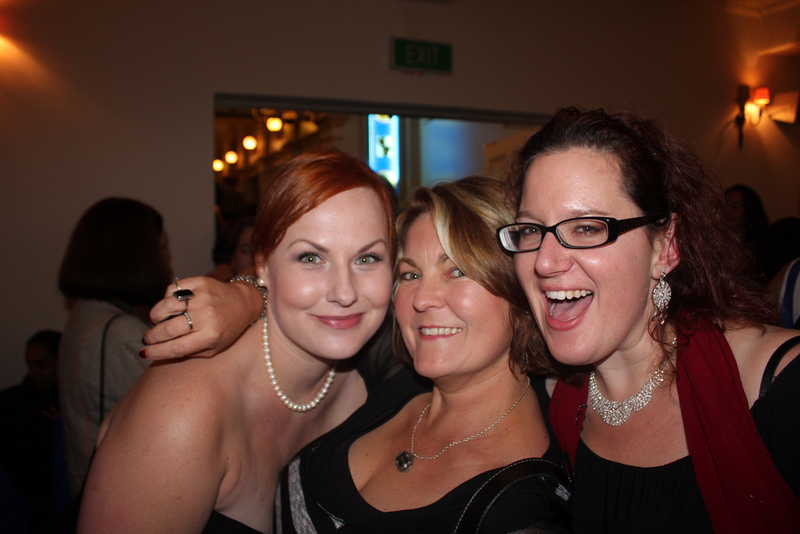 Everyone was all dolled up — which is another thing I love about the Aurealis Awards! — and smiling, smiling, smiling. If you look at Cat’s photos, or at Tehani’s set, you’ll be greeted with a collection of people having a wonderful time, and all the smiles are genuine. Of course, I was walking around on cloud nine all night. I was so surprised to have won the Best Collection award that I fell out of my shoe on the way up to the stage. I felt so lucky just to have been on a shortlist with Paul, Tansy, Deb and Sue that, as much as everyone likes to win, I really was totally stoked with just having my name next to theirs for all the world to see. So I floated up to the stage, dropped my shoe (luckily my dress was long) and then floated back to my seat. And there I was, feeling the adrenaline starting to ebb, feeling so relieved that I’d managed to make a speech that sounded somewhat composed and moderately articulate… and then I heard Kirstyn say that I’d tied with Paul Haines for the Best Horror Short Story award. It was at that point that I lost all composure, and with it All The Words. I wish I could have had the presence of mind to say what an incredible honour it was to be on the winner’s podium with Paul. And, again, to have been on a shortlist with Deb Biancotti! Angela Slatter! And OMG MARGO LANAGAN! But as everyone saw, all I could muster was a goofy smile, a wide-eyed expression, and about a dozen shocked ‘thank yous’ before I sat back down. I was so happy to see Thoraiya Dyer win for Best Fantasy Short Story — two years in a row! — and loved that Kim Westwood’s The Courier’s New Bicycle won for Best Science Fiction novel (also loved her speech! ), that Jack Dann’s Ghosts by Gaslight won Best Anthology, and that the Galactic Suburbia podcast was awarded the Peter McNamara! The Rydges after-party was a wonderful, champagne-filled romp (note to self: next year, eat dinner first!) and it was so much fun catching up with friends I don’t get to see anywhere near enough, seeing Facebook and Twitter friends in 3D, and chatting and chatting and chatting — until the bar staff kicked us all out! Thanks, everyone, for a fabulous weekend! Can’t wait to see you all again at Continuum! Tags: angela slatter, angie rega, aurealis awards, bluegrass symphony, Cat Sparks, continuum, deb biancotti, galactic suburbia, jack dann, kate forsyth, kirstyn mcdermott, margo lanagan, Paul Haines, specfaction nsw. Bookmark the permalink. Congratulations! I’ve been looking forward to reading your collection. And, if I may be so bold—my God, you are lovely! It was such a great night… just a little too short. Next year, I reckon we should have an Aurealis weekend! Crikey!!! … and I wasn’t there 🙂 So happy for you Lisa Lynn and so so proud!!! … Congrats.